OxyContin is the brand name for an opioid analgesic containing the active ingredient oxycodone (also found in Percocet and Percodan). OxyContin is a legal narcotic that is available, by prescription, to treat severe pain. OxyContin is a controlled-release medication that, when used correctly, provides extended relief of pain associated with cancer, back pain, or arthritis. However, often when the drug is abused, the tablets are crushed and snorted, chewed, or mixed with water and injected- eliminating the time-release factor and allowing for a quick and intense rush to the brain. This practice can lead to overdosing on OxyContin’s active ingredient, oxycodone, by releasing too much of the medication into the bloodstream too quickly. OxyContin is highly addictive – so higher doses of the drug must be taken when a tolerance develops. Illicit users of the drug have risen drastically and steadily over the last few years. OxyContin is also known as Oxy, OxyCotton, Oxy 80 (for the 80mg dose), or OC. 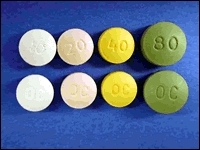 OxyContin most commonly exists in tablet form. These round pills come in 10mg, 20mg, 40mg, 80mg and 160mg dosages. OxyContin also comes in capsule or liquid form. The most serious risk associated with OxyContin, is respiratory depression. Because of this, OxyContin should not be combined with other substances that slow down breathing, such as alcohol, antihistamines (like some cold or allergy medication), barbiturates, or benzodiazepines. Other common side effects include constipation, nausea, sedation, dizziness, vomiting, headache, dry mouth, sweating, and weakness. Toxic overdose and/or death can occur by taking the tablet broken, chewed, or crushed. People who abuse the drug (by removing the time-release coating) will experience effects for up to 5 hours. The high that is felt is opiate-like – a sedate, euphoric feeling.